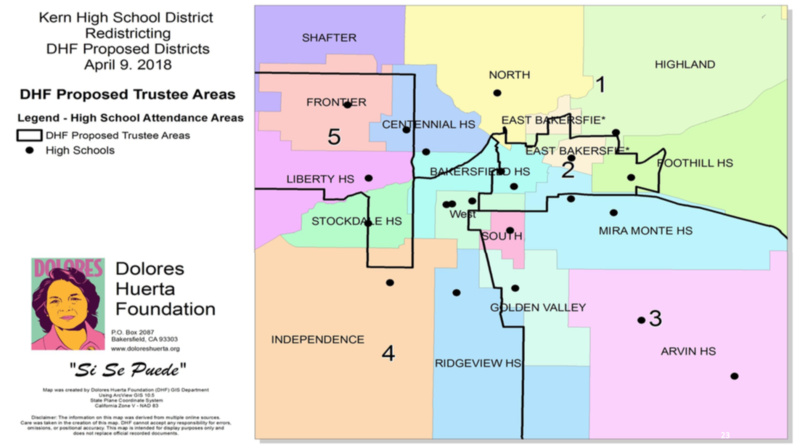 Join DHF and make your voice heard at a Kern High School District Board of Trustees Redistricting Meeting! 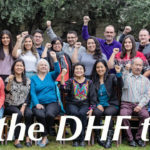 The Dolores Huerta Foundation (DHF) encourages the community to participate at the next Kern High School District (KHSD) Special Board Meeting. This meeting will be held on Monday, April 16, 2018 at 7:00 P.M. at the district Board Room at 5801 Sundale Avenue. Express public support for the adoption of criteria which will lead to the the redrawing of district boundaries which safeguard electoral fairness. The purpose of this meeting is for the Board to receive input from the community on a new district map. This will be the third out of five special meetings the KHSD Board is scheduled to have in the coming weeks. So far, DHF and Shelley Lapkoff, PhD, a demographer working with KHSD, have presented district maps to the Board. The Dolores Huerta Foundation continues to encourage the Kern High School District to provide a fair and just review for redistricting plan to ensure representation for all communities including South Kern, which currently has diluted voting power. For more information on the maps already presented to the Board, please visit the KHSD’s website at https://www.kernhigh.org/apps/pages/boardpresentations. 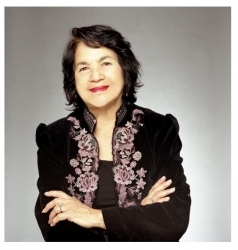 For DHF’s maps, you may visit http://doloreshuerta.org/gis-geographic-information-systems/. Your voice is needed to help us put an end to gerrymandering which dilutes the political influence of underrepresented minority communities especially in the areas of South Kern. Arvin and Lamont deserve representation on the KHSD Board of Trustees! Through this process, the KHSD Board of Trustees will adopt resolutions specifying criteria to guide adjusting trustee area boundaries and provide instruction to demographic consultant on formulation of trustee area boundary adjustments based on criteria. This is the first of five meetings in the redistricting process. The KHSD Board will vote on the new districts at the final meeting on May 14, 2018.